When tragedy strikes, most people will try to find a scapegoat; it’s human nature to point a finger and blame someone or something, rather than chalk it up to chance or luck (even saying it’s “fate” or “God’s will” is giving a reason for why misfortune occurs). But when other people with specific agendas (i.e. politicians, and sometimes a lawyer) shift the focus of blame to a particular entity YOU like or are a fan of, then problems arise. What I have a problem with is that these FANS only care about losing their precious entertainment, instead of examining and acknowledging the individual behind the tragedy and the actions needed to be done in order to maintain a smoothly running and orderly society. Continue Reading "Focal Point – Acting Out Anime"
NTV aired a three hour special of DEATH NOTE today that covered pretty much the entire L arc with some added material. It started out with a scene of a Shinigami approaching Ryuk wanting to know about the human world because he’s gotten tired of the Shinigami world. Ryuk proceeds to tell him about a man who tried to change the world and become god, and this sets up the recap through the first arc. Most of it was stuff we’ve already seen in the original series (they even included the potato chip scene), but there were some additional scenes too, (highlight to read) including L meeting Light in a theater, everyone visiting L’s grave, Light declaring his victory over L’s grave (after everyone else leaves), and bloody shots of the deaths of members of the Yotsuba group. 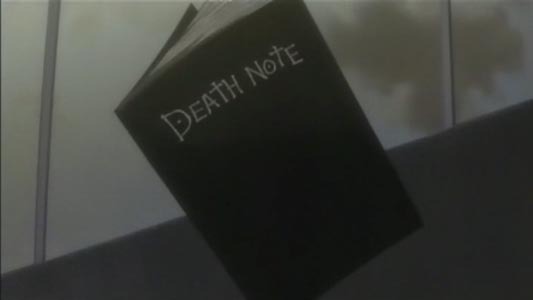 The episode ends with Ryuk looking at how Light’s name is written in his Death Note and commenting on how Light wasn’t a god back then. If you’re a big fan of the anime, you might consider watching it, but for the most part, I didn’t think this was worth it if you’ve already seen the entire series. There was no episode of Yamada Tarou Monogatari aired today because of a track and field event. Episode 09 airs next Friday. Several people have asked me for the Shana II commercial, so here’s the download: Mirror 1, Mirror 2, Mirror 3. Continue Reading "Random Musings – DEATH NOTE: R and Miscellaneous Notes"
The news of Takada’s death causes many television stations to immediately start to compete with each other to replace her as Kira’s spokesperson. Continue Reading "DEATH NOTE – 36"
The days pass quickly and Takada soon gets a confirmation message from Mikami, so she relays it to Light like he had told her to, indicating to Light that Mikami found out he’s being followed. Continue Reading "DEATH NOTE – 35"
With this new revelation on Mikami, Near decides that they need to get close to him, but he is also aware that the existence of a Shinigami with Mikami poses a problem if they want to follow him. Continue Reading "DEATH NOTE – 34"
With all the pieces in place, N decides to head to Japan, though he asks his commander Lester to go with him because he’s never ridden a plane alone before. Continue Reading "DEATH NOTE – 33"
Mikami Teru was a boy with a strong sense of justice who could tell the difference between good and bad. Continue Reading "DEATH NOTE – 32"
With Misa watching the television broadcast intently with her Shinigami eyes, Light urges Near to escape from the building that is under attack by an angry mob. Continue Reading "DEATH NOTE – 31"
Based on what’s happened so far, Near suspects that Kira and the Japanese investigation are working together and that Kira is actually the second L.
Continue Reading "DEATH NOTE – 30"
Shidoh pays Ryuk a visit because he wants his Death Note returned, but Ryuk doesn’t know where it is and suggests that Shidoh look for it himself. Continue Reading "DEATH NOTE – 29"
Since Near proposes that they cooperate in the investigation of the kidnappings, Light tells him that Sayu was kidnapped and is being held ransom for the notebook. Continue Reading "DEATH NOTE – 28"
Mello is quite shocked to learn that L is dead, but Near hardly shows any emotion to the news. Continue Reading "DEATH NOTE – 27"
Investigating L’s computer, Light finds that L had kept a file on everything in the Kira investigation. Continue Reading "DEATH NOTE – 26"
After instructing Misa to continue the criminal killings for him, Light returns to the investigation where L is questioning Rem about the Death Note and about the Shinigami eating apples. Continue Reading "DEATH NOTE – 25"